If shipping doesn't clean up, it could contribute almost a fifth of the global total of CO2 by 2050. A group of nations led by Brazil, Saudi Arabia, India, Panama and Argentina is resisting CO2 targets for shipping. Their submission to the meeting says capping ships' overall emissions would restrict world trade. It might also force goods on to less efficient forms of transport. This argument is dismissed by other countries which believe shipping could actually benefit from a shift towards cleaner technology. 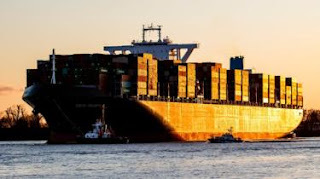 The UK's Shipping Minister Nusrat Ghani told BBC News: "As other sectors take action on climate change, international shipping could be left behind. "We are urging other members of the International Maritime Organisation (IMO) to help set an ambitious strategy to cut emissions from ships."